Mozart's The Abduction from the Seraglio (Die Entfuhrung aus dem Serail). 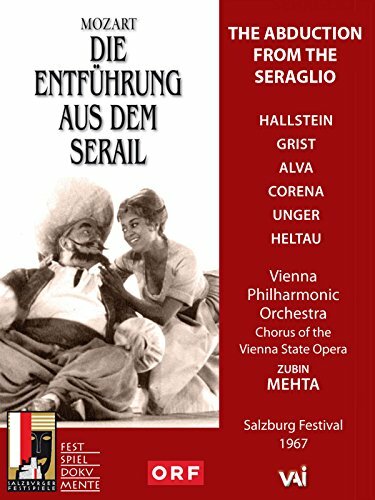 Zubin Mehta leads the Vienna Philharmonic Orchestra in this historic live 1967 Salzburg Festival performance of Giorgio Strehler's legendary production. Cast features Ingeborg Hallstein, Reri Grist, Luigi Alva, Fernando Corena, Gerhard Unger, and actor Michael Heltau in the speaking role of Pasha Selim.